Through a variety of community programs, we provide educational opportunities to children and adults for them to learn about organic farming, caring for herb and vegetable gardens, healthy living options, and environmentally-friendly, sustainable life choices. Thousands of school children have visited the farm every year through our hands-on Field Trip Program, where kids become “Farmers for a Day” and learn about where food comes from! Our Workshop Series is open to the public and is a wonderful way to connect with like-minded individuals and learn something new. Attendees enjoy expert advice on organic gardening, plants, food choices, healthy/sustainable living, storing and preparing farm-fresh veggies, and many other topics! Volunteering is a popular “hands on” learning experience at Sweetwater. We host volunteers that range in age and background from corporate and school groups to families and individual learners. All are welcome, including children under supervision. Volunteers can assist with a variety of farm tasks such as planting, harvesting, and weeding. Other non-farming volunteer work is also available for those not as interested in getting their hands in the dirt! So, you could plan a field trip with your club or school, spend an afternoon in the greenhouse volunteering, attend a workshop to learn about back yard composting, or take a farm tour with your kids! Maybe you’d just want to check out our farmer’s market, and learn about how a CSA works? 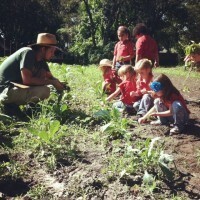 However you would like to get involved, you’re sure to learn and enjoy your time at Sweetwater Organic Community Farm. We are now accepting applications for Workshops. Please visit our Workshop Application page for Workshop Information and an Application.